The story is in the ice. 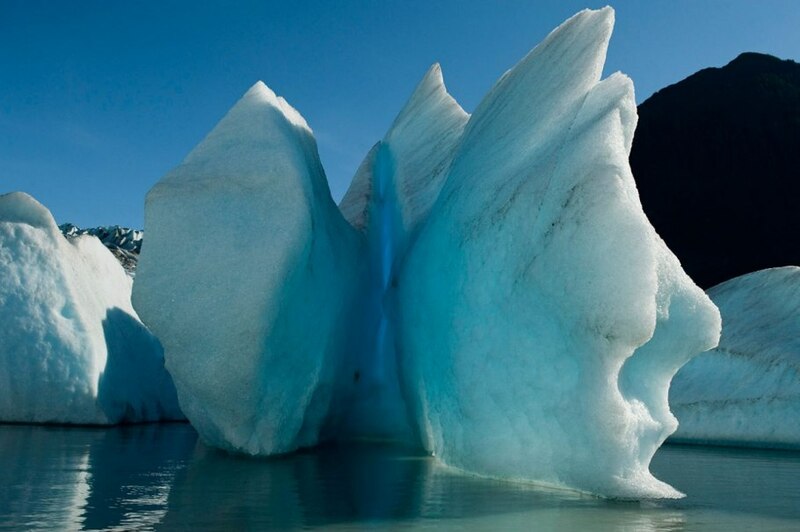 So says photographer James Balog in the film Chasing Ice, a documentary of his multi-year quest to photograph climate change. The film follows Balog as he pursues his obsession of catching on film dramatic changes in glaciers in Alaska, Greenland, and Iceland. Through technological and physical failures (time-lapse doesn’t exactly work if the timer freezes at 40 below; Balog goes through three knee reconstructions just to keep up his habit), Balog perseveres to prove the stunning—and horrifying—truth of glacier retreat due to human induced warming trends. Glaciers that were taking decades to retreat several miles have thinned and retreated ten or more miles in three years. Normal calving events have turned into massive shelves breaking off. Melt water and carbon trapped in ice layers are contributing to the feedback loop, increasing the rate at which glaciers melt and recede. As I watched the film, I was swept away by the crushing beauty of old ice that has never seen the surface of the world in millennia, suddenly revealed when a calved berg roles under its top heavy weight and a glimpse of the darkest, most inhuman luminescent blue is glimpsed before it plunges back into the water. The sequences of photographs in time-lapse reveal an animated landscape, a liveliness of being in the glaciers, that is nevertheless, as Balog mournfully explains, like an “old man dying.” The project is to understand these old men and their last words, to visually, graphically, learn what it means to “visualize change…to see what was and what will be” through the “story that the glaciers are telling.” Balog argues that we have a “problem of perception”—ice, glaciers, climate change—it’s too abstract, too far away, too somebody else’s problem, too inhuman. And so he humanizes the story. He brings the glacier’s geologic time into human time—three years for the filming of glacier retreat and the story of generational responsibility in the form of a father’s quest to leave something for his daughters. The story that the glaciers tell becomes the story of his quest to tell their story. Sitting in an old, somewhat indy, theatre in California, my friend looks around and notes the variety of styles and colors of down jackets in the audience. The coastal fog is coming in, it’s chilly. But it is that type of crowd. A woman saves a seat with a climbing harness. We are the converted. If we can afford to we drive hybrid cars. If we can’t, we bike. We eat organic, shop at the farmer’s market, are vegetarian, participate in beach clean-ups and anti-development in sensitive habitat demonstrations. We want a future for our children. After watching or reading about all the films that are trying to raise our awareness about climate change and the loss of polar ice—Happy Feet, Arctic Tales, Growing Up Arctic, Chasing Ice, and I’m sure many others—to get us adults to do something through reminding us of our responsibility to future generations, I have come to the conclusion that the story the glaciers are telling, the story that is in the ice, is distinctly not about or for future human children. Geologic time is profoundly inhuman—epochal change, the Wisconsin Ice Age—none of it has anything to do with the preservation of some life over others, some organisms’ positive life choices against the negative outcomes of others. The story that is in the ice that this film cannot finally tell is that the inevitable loss of ice is not about hurricanes, floods, drought, and the extinction of polar bears. The extent of the loss reveals the expiration date of the human species. We can tell stories about our children to galvanize action on their behalf, but the unspoken—the unspeakable—truth is we cannot keep having future generations. The story is written in the ice—carbon increase, soot trapped in ice, the release of methane. The technology and resources used to make the cameras that document change and the hybrid cars that relieve our anxiety about our culpability—our too human response to this too-human story of one man’s obsession to “do something” so his daughters’ won’t ask “why did you not do something?”—perhaps simply points out that we need a different type of story, a new reading practice, an engagement with glaciers that is not about our children’s future on this planet, but our own. Our own responsibility. Our own love affair with ice. With polar bears. With micro-cosmic bodily identifications and macro-cosmic orderings of agents that can be inhuman, yet still invite us to incorporate their right to life with our own. For further reading about glaciers and sea-ice I highly recommend Barry Lopez’s meditative chapter “Ice and Light” in his book Arctic Dreams, Julie Cruikshank’s amazing ethnographic reflections in Do Glaciers Listen?, and Elizabeth Bradfield’s intricately connective poems in Approaching Ice.